Just in time for the 2014 World Cup, journalists Mauricio Savarese and Euan Marshall have released A to Zico: An alphabet of Brazilian football, an independent eBook on the history and culture of football in Brazil. For now it is available only on Kindle. Using an A to Z format, the authors selected 26 topics that provide an introduction to Brazil in a football context. There are chapters on important players and coaches, as well as the game’s struggles with racism and violence and the unique relationship between football and music in Brazil. 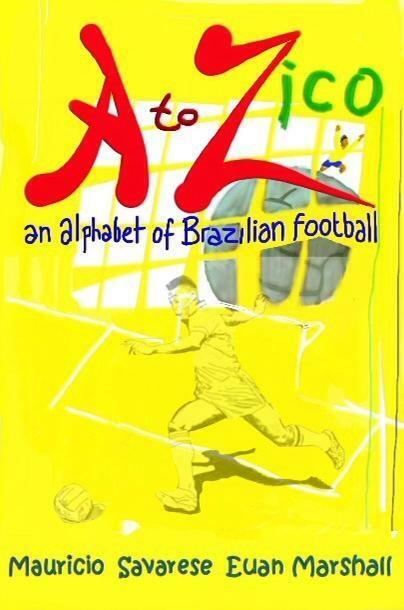 A to Zico… combines the perspectives of a Brazilian journalist who grew up surrounded by the culture and a Scottish journalist who has immersed himself in it later in life. The book also includes hand-drawn illustrations from talented artist Harry Marshall. In M… is for Maracanazo, the book details the 1950 World Cup final, which Brazil lost to Uruguay on home soil, and the long-lasting cultural effects it caused, from the racial persecution of black goalkeepers to an enduring inferiority complex that has yet to dissipate. In D… is for Dictatorship, the role of Brazil’s military regime (1964-1985) in the nation’s favourite sport is explored, as well as how the generals used the game for their own political gains. For more information about the book, contact Mauricio Savarese at savarese.mauricio@gmail.com, or Euan Marshall at euanmarshall1@gmail.com. Both are also available on Twitter and based in São Paulo. Mauricio Savarese has a 10-year-career in journalism and has worked at Reuters, FourFourTwo Brazil and news website UOL, covering politics, sports, economy and general news. Major coverage includes two Olympic Games, two presidential elections in Brazil, three elections abroad and a Pope conclave. He is FourFourTwo’s correspondent in Brazil since 2010 and a freelancer for all things Brazil and Latin America. He has appeared on TV, radio and print as a Brazil specialist, not only on football. His blog A Brazilian Operating in This Area has been established for one year as a reliable source for Brazil analysis. Euan Marshall is a Scottish freelance journalist and South American correspondent since 2011. He has been based in São Paulo, Brazil for the last three years and has worked with various publications, such as The Mirror and The Metro. He also maintains a personal blog, I Like Football Me, where he writes about sport in South America. Posted on 08/06/2014, in Uncategorized and tagged A to Zico, football, politics, World Cup. Bookmark the permalink. 3 Comments. Now is the time to study up on soccer/futebol/football history to make interesting conversation during all those World Cup game parties!